Belated Happy Nutella Day! I know I am a day late but I had to do my bit to spread a little Nutella love. Nutella is, after all, one of my very favorite things. I have been eating it since I was a child (in those one-serving packets…do they still have those?) and almost always have a jar (or more) in my pantry. I couldn’t tell you my favorite way of eating it because I just have too many, and really, it is fantastic any way you eat it. It serves you equally well if you are in need of some get-up-and-go on a dreary morning or if unexpected guests suddenly land on your doorstep (just dollop some over vanilla ice cream and you’ve got dessert). It is simple, delicious, available, accommodating, well-loved, sublime. It’s been embraced by everyone from the little girl that lives next door to Pierre Hermé. Any way you look at it…Nutella rocks. So here is my small part in the worldwide homage that is Nutella day…Self Frosting Nutella Banana Cupcakes. Not to be confused with the Nutella Banana Muffins which I have made before. For these, I used Elise’s Banana Bread recipe (which I also have made before) and baked them as cupcakes instead of a single loaf. Before baking, I topped each cupcake with a splodge of Nutella, then used a toothpick to fold and swirl a bit of batter over it as I did once upon a time when these cupcakes were all the rage. You can use your own favorite banana bread recipe if you’d like instead. The marriage of Nutella and banana is meant to be, inevitable, written in the stars really, and these cupcakes are proof positive of that. I think I prefer when Nutella is not totally mixed into baked goods, but left like these cupcakes’ solid streaks, as the flavor is more pronounced. ***Nutella Day is brought to you by Ms. Adventures in Italy and Bleeding Espresso. I can't wait to try this. Do you think the self-frosting technique would work with the batter cooked as a bread instead of as cupcakes? Hola, Joey! 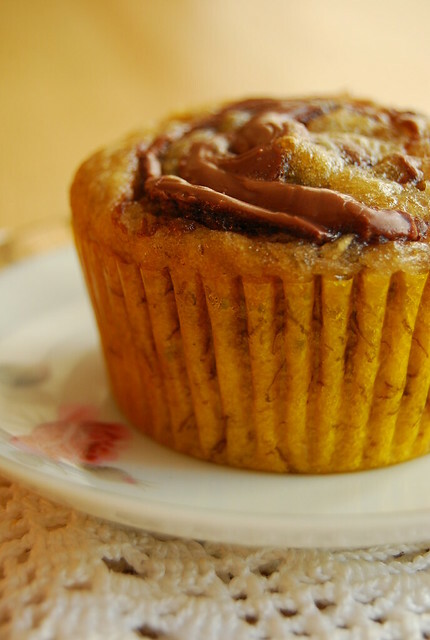 Those cupcakes look truly superb – bananas and Nutella make for a tasty combination. love to see that Nutella peeking out! Banana and nutella, sounds like a perfect marriage! There is a nutella day?? Well I could certainly eat your beautiful nutella cupcakes everyday. They sound and look amazing! Hi Midge! They really are a match made in heaven! Will check out your blog for the thin pillows review! Hi Chef D! Hooray! Will look for those and relive my childhood glories! Hi Gattina! It is! I love these types of cupcakes…kinda homely but really good! I love Nutella but I have one question. Is it a chocolate spread with hazelnuts or a hazelnut spread with chocolate? Never too late for this! Yum! as a brew crew member, I was thinking about what some great brunch ideas would be. Do you have any suggestions? I definitely don't eat as much nutella as I should, actually, it's been years. But you make nutella and banana bread sound so delicious together. I love Nutella! It's a shame I only discovered it five years ago on the streets of Paris. Walking around getting hungry, we spotted a crepe stand. Trying to save money, I chose a simple Nutella crepe. Wow it was awesome! These cupcakes look like a great combination. Hi Wine and Food! Either way it’s divine! Hi Weekend Gourmet! Hope you and your little boy enjoy it! These sound delicious. Nutella is a favorite at our house. These cupcakes look absolutely delicious. Love the idea of a banana-nutella combination! These are mouthwatering, Joey! I'm a sucker for Nutella and also love baking with bananas. Yum! It looks sooo totally delicious.